Was Sherlock Holmes a Model of Victorian England? Sure, Sherlock Holmes was a fictional character (don’t tell BBC’s Sherlock fans that! ), but he shows us sides of his country that were very representative of Victorian England. Readers of Sir Arthur Conan Doyle’s Sherlock Holmes novels and short stories will agree that going on an adventure with Sherlock is akin to taking a step back in time to a very different, and exciting, place. Calling all Sherlock Holmes fans! Yes, you really can visit 221b Baker Street. Travel with us to late 19th/early 20th century England, and we’ll explore the inspiration behind the famous master of mystery! The prolific author was actually born in Edinburgh, Scotland, where he also attended university med school. It was at the University of Edinburgh that he met his mentor and primary muse for his famous detective character, Dr. Joseph Bell. Dr. Bell was incredibly observational and paid heavy attention to detail, and even “studied the hands of his patients because calluses or other marks could help him determine their occupation,” as dished by the Chronicles of Sir Arthur Conan Doyle. Sound familiar? Not only was Sherlock based on a real person, but he was created during the era of Victorian England, and the story takes place in the same time period. Naturally, this allows the bizarre detective to give us a peek into what it was like to be a person (or detective) in London in the late 1800s and early 1900s. Doyle’s stories do this so well that PBS says he is regarded by many as “the perfect hero for his age.” Sorry, Guy Fawkes—you had your moment. Sherlock Holmes novels and short stories explore a time where science was redefining English society and technological advances were booming. Fingerprinting was becoming common practice the year The Hound of the Baskervilles made its debut. And most importantly, Mr. Holmes was a true Victorian gentleman in every way: working valiantly to protect social and class order, while making sure he is clean-shaven and his attire properly laundered at all times. So if you ever want to take a short trip back in time to a wildly-different England, just over 100 years ago, flip through a Sherlock Holmes novel or one of the many engaging short stories. 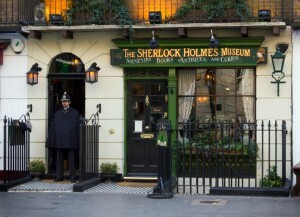 Or, just visit the infamous 221b Baker Street in London, where the Sherlock Holmes Museum is perfectly preserved in Victorian glory for visitors to admire! Travel to England and see London in person! AESU offers several trips to England, including: Cosmopolitan, Euro Spree, Explorer, Euro Focus, and our most popular tour, Great Escape. Explore England and its rich history and culture, plus see London and roam the same streets Sherlock Holmes wandered! And, for a limited time, take a friend and both of you get $100 off certain AESU tours – ask us for details! This entry was posted on Wednesday, April 13th, 2016	at 3:45 pm	. You can follow any responses to this entry through the RSS 2.0	feed. Both comments and pings are currently closed.